I've been stalking this car since I first spotted it almost a year ago. In that time its moved about ten feet and the notes I've left on the car have gone unanswered. Its a rough Rosso Red example from 1988 or 1989. 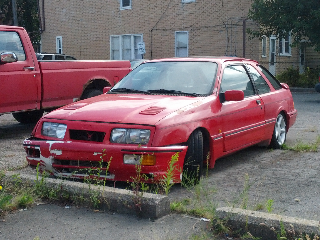 Despite its current neglect, at one point someone cared enough to install euro glass headlights, cosworth sierra grill, cossie front bumper, cossie hood vents, RS wheels, a Rapido intercooler, Borla exhaust, and lowered suspension. This car has everything I wanted from the BAT catalogue but couldn't afford in my college days when I still owned one of these. 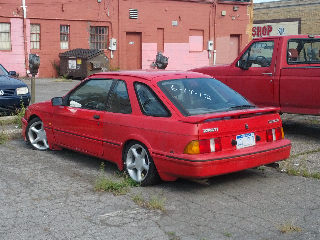 Its not hard to locate, parked in Hamtramck just off Campou near St Florians. Hopefully someone scavenges the good bits before its towed away. It's nice to find people who appreciate these cars. I'm the sole owner of this car and, sadly, the reason it's in the shape it's in is because about a week after the Cosworth front end was installed, a negligent minivan driver drove over a truck tread in the road and kicked it up into the front of the car causing all the front end damage. Insurance company totalled it and gave me $700 minus some for salvage. I don't have a garage so I've been taking it with me as I move around never willing to part with it. Correction though: Rosso Red was the red used on the XR4Ti until 1988. Once they started painting the lower panels and bumpers on the car they switched to Radiant Red which this car is. It's an 89 with all the options except, of course, the automatic transmission. I'm sorry I didn't answer you enough to at least meet you. I've gotten a lot of interest in the car over the years.